There’s something of a 2005 exuberance in the euro area’s periphery. Greek bond yields haven’t been so low since Helena Paparizou won the Eurovision song contest that year, while investors are flocking into Italian debt despite a recession and a widening budget deficit. Mario Draghi may be warning about dark clouds on the horizon, but the ECB’s decision to keep interest rates at rock bottom for longer is fanning the gold rush into the most indebted states, amid a desperate search for yield. Skeptics may say that investors will end up hurrying for the exit when the music stops. Optimists might note that Greece and Italy’s chances of winning the Eurovision this year aren’t that bad. Notre-Dame Fire | A major fire ravaged the Notre-Dame cathedral in central Paris — the latest in a string of tragedies to strike the French capital. The damage to the cultural landmark prompted Emmanuel Macron to postpone a policy speech, in which the French president was due to present conclusions from a 10-week series of debates designed to assuage Yellow Vests protesters. Delay Gratification | After leaders delayed Brexit until Oct. 31, the U.K. Parliament responded to EU Council President Donald Tusk’s pleading that Britain should “not waste this time” by immediately agreeing to go into recess for two weeks. While it’s quiet in London, Tusk will today join European Commission President Jean-Claude Juncker to discuss the extension and its consequences for the European Parliament in Strasbourg. Car Tech | The European Parliament is due today to approve new road-safety rules that’ll require cars in the EU to have a raft of new features from 2022, including automatic speed limiters, accident data recorders and driver drowsiness alerts. The law, already agreed with EU governments, also covers vans, trucks and buses. Whistleblower Rules | EU lawmakers are set to approve new protections for people reporting breaches of law. The directive will replace the current patchwork of regulations with EU-wide minimum standards meant to safeguard citizens like Antoine Deltour, the Luxembourg accountant who helped reveal the ways in which international corporations lower their tax bills. Swedish Star | Swedish schoolgirl and climate activist Greta Thunberg will show just how much of the international spotlight she has grabbed by discussing ways to fight global warming at a meeting of the EU Parliament’s environment committee today. Trade Talks | EU governments gave the green light to start trade negotiations with the U.S., as both economies seek to rebuild frayed relations a week after threatening each other with billions of dollars in new tariffs over a 14-year-old aviation dispute. Negotiations will start amid escalating transatlantic tensions, with the U.S. having accused the EU of failing to build on previous good faith and delaying the start of talks. 5G Networks | Huawei’s ability to make inroads into Europe’s telecom infrastructure may be more about regulatory hurdles than outright bans. The region’s national regulators have been tightening standards that may hit the Chinese company harder than its main European rivals, as telecom operators hurtle toward their 5G rollouts. Slovakian Example | Zuzana Caputova is hoping her victory can serve as an example for other political forces who are trying to beat back a wave of nationalism sweeping the EU before the bloc holds parliamentary elections next month. In this interview with Radoslav Tomek and Peter Laca, Slovakia’s president-elect explains how a murder made it personal to run in the election. Reputation Revamp | Bank of Spain Governor Pablo Hernandez de Cos and his team are on a mission to repair the reputation of the central bank, still disparaged for its failure to crack down on a credit binge that culminated in a property crash and 2012 bailout. Confused about what’s next for Finland, after the tightest election in more than half a century? You’re not the only one. 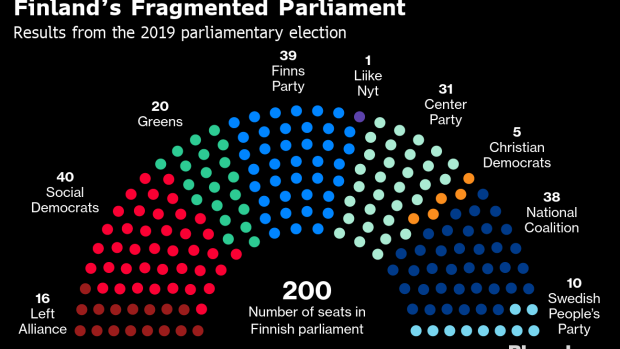 The outcome — which saw the anti-immigrant, euro-skeptic Finns Party rewarded by voters — sets the stage for tough talks on forming a coalition, Kati Pohjanpalo explains in this handy guide. --With assistance from Alexander Weber, Jonathan Stearns, Ian Wishart and John Ainger.